Rosita continues to run and hide from the herd but ends up collapsing from dehydration. 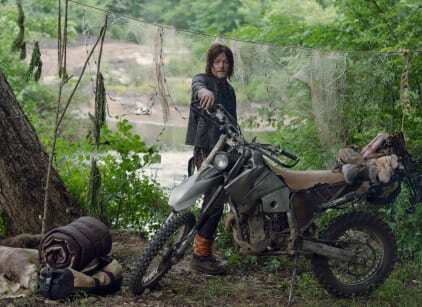 After encountering Daryl in the woods, Carol and Henry give him a lift back to his camp. Since Rick's body was never found, Daryl has since been living in the wilderness to aid his search for any sign that Rick might still be alive, and has taken in a German Shepherd as his new pal. However, Carol tells Daryl that he needs to let Rick go. Carol attempts to ask Daryl to assist them on their journey to Hilltop and teach Henry how to survive, but Daryl declines citing that he needs to learn just like the rest of them have. That night, Daryl finds his dog caught in one of the walker traps as walkers approach, but Daryl and Henry are able to save it. Henry is able to convince Daryl of accompanying them to Hilltop and they decide to set out the following morning. Jesus has become the leader of Hilltop after Maggie left to help Georgie with a new community. Jesus meets in secret with Aaron and trains him to fight. During their lunch together, they see a flare fired and discover it to be Rosita, who is taken back to Hilltop for treatment. Rosita reveals that she left Eugene hidden in a barn. Michonne, Siddiq, and DJ continue to lead Magna's group to Hilltop, but make a stop at their original camp to see if their story checks out but find that it had been overrun by walkers, and the group is forced to seek shelter when they lose daylight. The following morning, the group is forced to flee when the same herd that attacked the camp wanders through. Gravely outnumbered, Michonne reluctantly gives Magna, Yumiko, Luke, Connie, and Kelly back their weapons and are able to fight their way through the herd, and continue their trek. Daryl, Carol, and Henry eventually arrive at Hilltop. Carol tells Jesus that Henry wants an apprenticeship as a blacksmith. Jesus informs Daryl of Rosita's condition and that Eugene is missing. Daryl agrees to assist Jesus and Aaron with the search and the three set out to look for their friend.